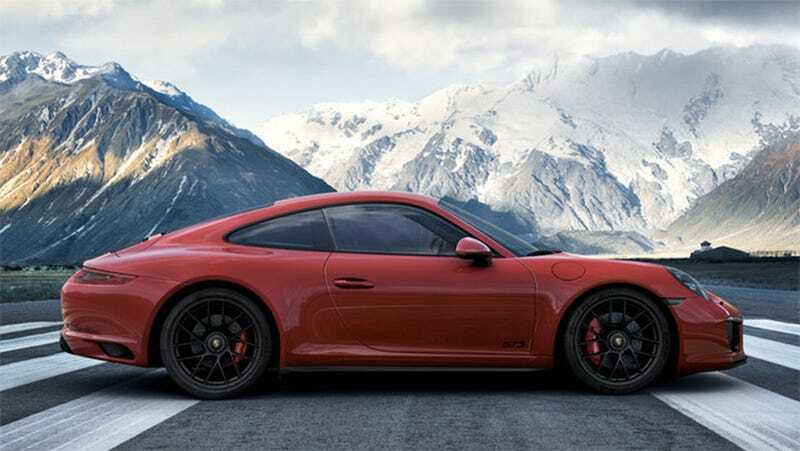 What Do You Want To Know About The Porsche 911 GTS? The 2017 Porsche 911 GTS is pure: you can run its 450 horsepower turbocharged flat six with rear-wheel drive and a manual transmission. Tomorrow I’ll be terrorizing the streets of Tahoe in a few of these and also spending some time with the people who put them together. What do you want me to ask them about? Porsche has GTS variants of the hardtop, convertible and targa-roofed cars. It starts at about $120,000 and is supposed to be able to snap to 60 mph in just under four seconds, running up to a 190-plus mph top speed. But this car isn’t really about acceleration runs. It’s for carving back roads and brisk cruising in relative comfort. Porsche will even let you spec the seven-speed PDK if the seven-speed manual transmission isn’t for you. The same’s true of the drivetrain; you can get AWD instead of RWD if you so desire. So you know the drill: leave questions in the comments and I’ll do my best to answer them here as well as in the First Drive write-up that will go live soon. I Can Finally Afford A Porsche 911 But I Don&apos;t Know Which One To Get! What Should I Buy?